Use the form below to inquire about Heritage Bungalow near Dibru River . Use the form below to reserve for Heritage Bungalow near Dibru River . This is a Non-AC family room with a king size bed and a twin bed. This is a Non-AC room with a double bed and an ensuite bathroom. This is a Non-AC room with a twin bed and an ensuite bathroom. A gateway to nature’s best-kept secrets, the Heritage Bungalow near Dibru River is the perfect haven for a relaxed holiday. The endless green carpet of manicured tea gardens is only one incentive to visit Tinsukia in Assam. It is the gateway to the wonderful wildlife sanctuaries and villages. You can expect some quiet time as the city hardly gets crowded. Its rich culture and magnificent landscapes will make you feel welcome during your holiday at the Heritage Bungalow near Dibru River. Lush green tea gardens, delicious cuisine, traditional architecture, rich colonial history, and the richest flora and fauna in the country – these are some of the defining features of the North East. Whether you are visiting the region for the first time or tenth, this heritage property will give you a glimpse of everything it stands for. 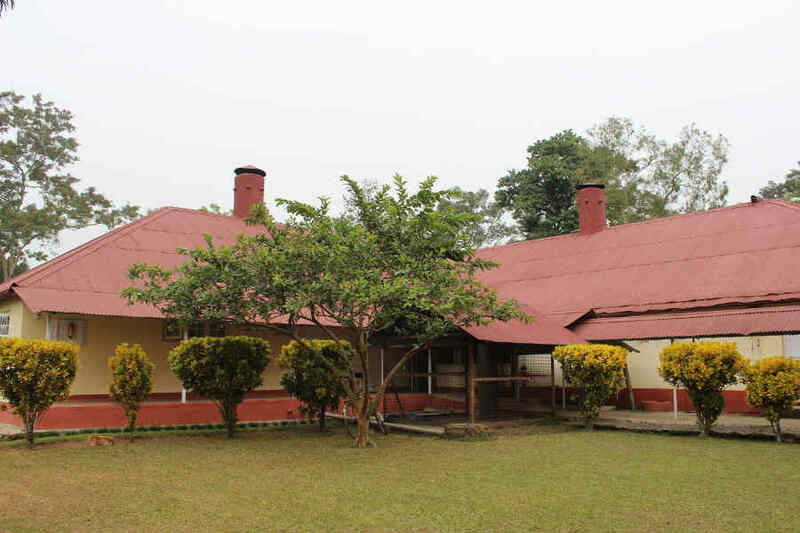 The sprawling tea estate of Limbuguri on which the Heritage Bungalow near Dibru River is located changed many hands. But what remains constant is its colonial charm. Over a hundred years old, the property is nothing less than a muted historian, telling its story through its beautiful, architecture, traditional design, impeccable flooring and age-old furniture. Located near the banks of the Dibru River, the tea estate bungalow is a haven for tea and nature lovers. Many migratory birds call the sanctuaries near the property their home. Bird lovers can expect to have the best time of their life during their stay at the heritage bungalow. The historic Heritage Bungalow near Dibru River is also a luxurious abode. It offers accommodation in three room types: Minla, Sibia, and Yuhina. The Minla room can accommodate four people. It is equipped with a king size bed and a twin bed. The Yuhina room is a non-AC room. It comes with a twin bed and accommodates two people. All the rooms have an attached bathroom with complimentary toiletries. The rooms are tastefully done with luxurious furnishings for maximum comfort. You will find everything you need for a comfortable, relaxed stay during your holiday. The estate bungalow is a treasured possession, a welcoming space where you can be sure to make great memories. Child complimentary up to 05 years. Any extra occupancy above the age of 05 years will be charged @ Rs 1500.00 + 14 % Govt. Tax= Rs 1711.00 on CP Plan per night with or without extra bed. All guests are requested to carry valid Photo Identity card which has a valid address for verification purpose. The photo Identity card could be Driving License, Voter ID card, Valid Passport etc. The guests will have show their Identity card on arrival at the front desk. This is a mandatory requirement by Ministry of Home Affairs, Government of Assam. Afternoon Tea: Rs 500.00 per pax per day + 9.00 % Service Tax= Rs 546.00 per pax per day. Reservations on 100% Advance Payment/bank transfer. Strolling in the expansive tea gardens where the Heritage Bungalow near Dibru River is located is a must do. Be warned, the breath-taking landscape might just overwhelm your senses! The sprawling green carpet is nothing short of therapy for the eyes. After you have soaked in the beauty of the surrounding tea gardens, head to the Dibru-Saikhowa National Park. It is a birdwatchers’ and wildlife lovers’ paradise. Keep a lookout for any of the inhabitants of the wildlife park, including royal Bengal tiger, leopard, Assamese macaque, capped langur, Asiatic water buffalo and barking deer among many others. You can also visit the Bherjan Wildlife Sanctuary to catch a glimpse of colorful winged wonders, such as bulbul, magpie, robin, woodpecker, Indian pied hornbill and much more. Would you rather stay back and while away your time doing nothing? This heritage bungalow is just the right place. Spend time with your family and friends, take a walk through the property and click some drool-worthy pictures, or read your favorite author, sipping a steaming cup of tea. Either way, you will feel more rejuvenated as ever. The Dibrugarh Airport is the closest airport from the Heritage Bungalow near Dibru River, located 39 km away. Flights from many cities, including Delhi, Kolkata and Mumbai service this airport. Guwahati Airport is located 529 km away from Tinsukia. Regular trains service the railway station in Tinsukia (15 km). The next closest station from the estate bungalow is Dibrugarh, located 48 km away. The Guwahati Railway Station is located 508 km away from Tinsukia. Services to all major stations are available from these three stations. Dibrugarh (50 km) is the nearest town from the location. A route to and from Itanagar (249 km), Guwahati (510 km), Imphal (523 km), Shillong (569 km) and other major cities in the East and North East offers a scenic drive to the estate property.